like a plate breaking in the middle of your chest. Bessie Smith Connolly has lived with her Nova Scotia grandparents since she was small. But at seventeen—grieving the death of her steadfast grandfather, smarting from a split with the boy she loves—she escapes to Saskatoon to be with her mother, Isabel. Bittersweet, clear-eyed, and deeply affecting, this marvellous debut novel charts Bessie’s course as she makes her way through her exploded family and out into the world. 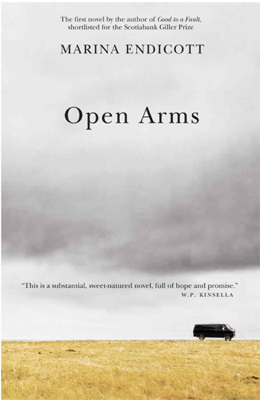 Open Arms is an emotional ride. When I least expected it, I found myself in tears. As a theatre student, Bessie is often accused of being insincere, of acting her way through life. In a fit of anger and jealousy, the one boy she loves tells her: “Faking it, being able to fake it, lessens the real power of life. Pretending to love lessens love.” What Bessie and those around her have to learn is how to step away from the script, drop expectations based on convention, and finally find the real power of the life and genuine love that they already possess.